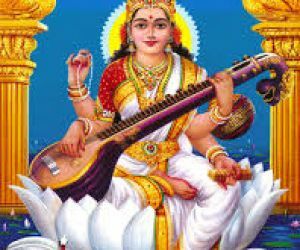 Basant Panchami, also known as Shri Panchami, is a Hindu festival dedicated to goddess Saraswati. This popular festival is observed on the fifth day of the Hindu month of Magh. Being an important Hindu festival, all Hindus celebrate this day with much enthusiasm and religious activities. 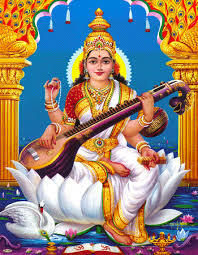 Also known as Saraswati Puja, it is considered to be the birthday of goddess Saraswati. She is the deity of wisdom and learning. Along with goddess Parvati and Laxmi, she is one of the three most important deities in Hindu culture. She represents all kinds of knowledge including science, arts, crafts and other skills. Known for her calmness and serenity, she is often shown seated on a white lotus with four hands and wearing a pure silk white sari. The four hands of the deity symbolize the different sides of human personality in learning. When seated on a peacock, she signifies that wisdom suppresses ego. On this day people observe various kinds of religious activities and large numbers of Hindus visit temples. Goddess Saraswati is dressed in yellow garments, yellow being the symbol of spiritual knowledge. People also dress up in yellow clothes and offer yellow flowers to deities in the temples. At homes people prepare yellow sweets and dishes such as Kesar Halwa and distribute among relatives and friends. Being an auspicious occasion, children are taught their first words, hence, marking the beginning of their learning period. Schools and colleges organize special pujas to worship goddess Saraswati. Students place their books at the deity's feet and seek her blessing for better learning. Other religious activities of the day include feeding Brahmans and performing the traditional ritual of ancestral worshipping known as Pitr-Tarpan. On this day, people also perform pujas to worship the God of Love, Kamadeva. Children fly kites on this day and a famous kite festival is observed in Ferozepur, Punjab. Basant Panchami symbolizes the beginning of spring, denoted by flowering and blooming of trees and crops. Signs of new and fresh life on trees and crops indicate the end of winter and beginning of happiness and joy.